Well, a BIG HUGE!! storm blasted through our area this morning. Strong front line winds and an inch of rain. Our power just went back on after a huge oak limb came down from our favorite oak tree on to the power lines. Our usual Monday post will be delayed due to the power outage. 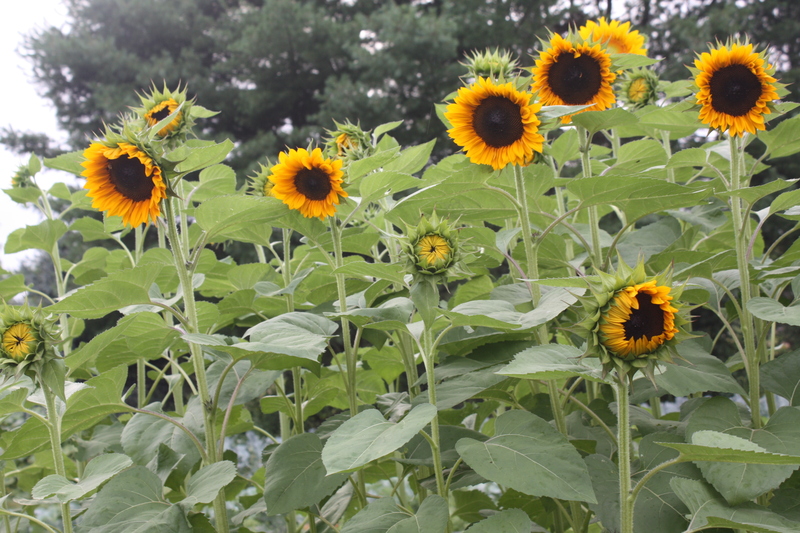 The newsletter and all garden updates will post tomorrow morning as I do not want to rush it out. We are fine and the garden is fine aside from 10 billion little plastic pots blew out the side of the greenhouse and ALL over the garden and sadly the popcorn crop is flat on the ground. It was challenging packing the boxes in the dark. More challenging to do it without our morning espresso but we got it done. Enjoy the great share this week. A surprise……packed full of wonderful delights. Tuesday Morning and life returns to normal with cooler working temperatures and the gift of much needed rain. A day of tidy up around the garden from the storm. A few hot days in the garden last week. It has been such an easy summer with cooler temperatures that a few days of it at the end are tolerable. 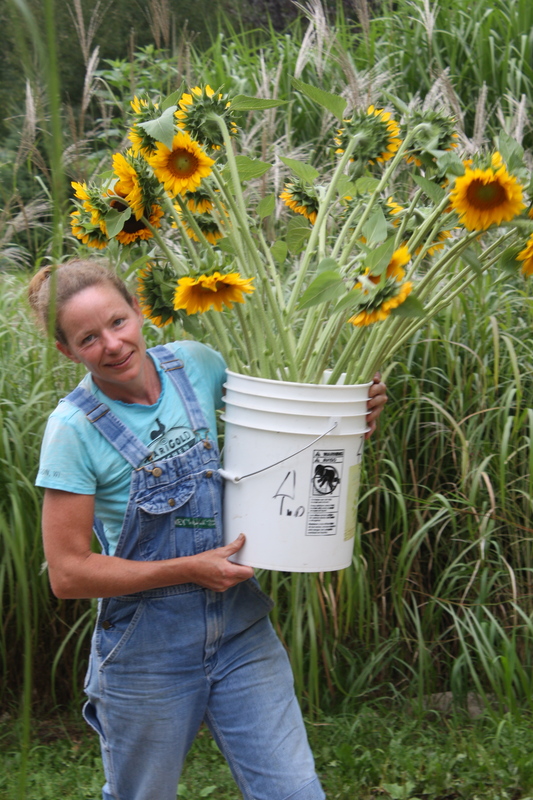 The hoophouse is transitioning again as we are planting the end of season crops and a few winter over experiments. More spinach, carrots, beets and arugula went in. 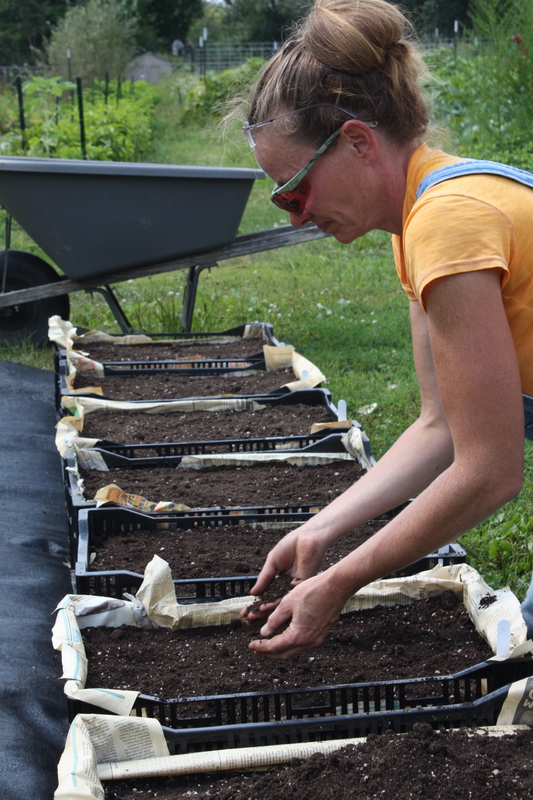 A long row of leaf lettuce and Fall head lettuce transplanted. 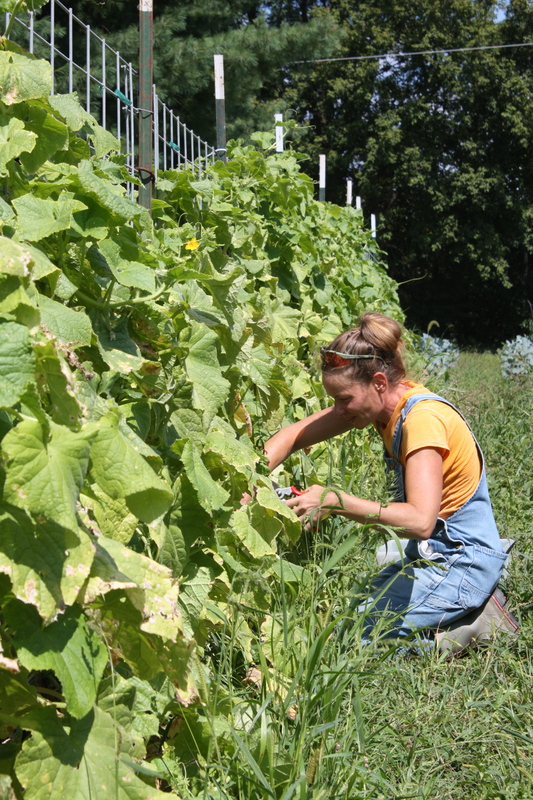 The cucumber vines are coming down this week and it sure signifies the end of summer to me. Final planting of kale and swiss chard will go in as we like to have tender new plants for the end of season of both of the Autumn treats. Scott spent many days on weed control and cleanup throughout the garden and turned the compost piles. We had huge tomato and pepper harvests in the heat wave. Finally! Planting carrots in crates for a late season harvest. We will move these into the hoophouse when it gets cold and hopefully have fresh carrots in the snow. We have a visitor in the garden. A woodchuck has moved in and is enjoying our late season broccoli crop as his personal salad bar. He chomped down the row of tiny winter share broccoli plants in one evening and we were disappointed but quickly reseeded after the discovery. Live traps are set but no luck yet. 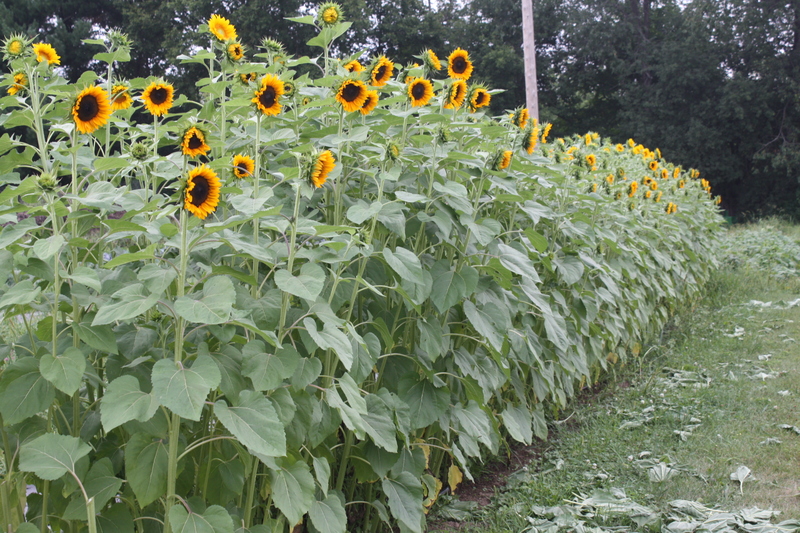 Our end of season crops look strong and abundant. A quick check of the winter squash patch looks good. 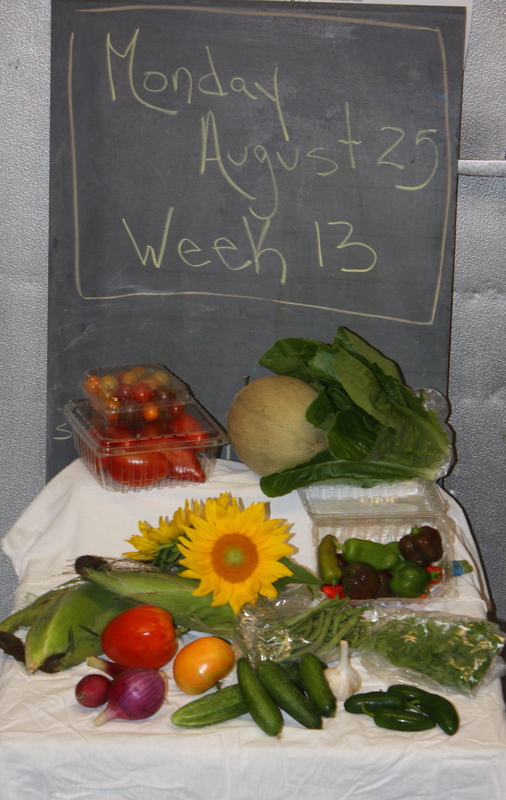 We started the spaghetti squash harvest and will start the summer carrot harvest this week. Fall leeks are thickening up and the edamame harvest is also on our harvest list. Summer abundance! 784 pounds of food went home with everyone. 1/2 pint Cherry Tomato Mix. Box of Tomatoes-An assortment for homemade salsa if you wish. Romaine Lettuce-Crisp delicious heads. One of my favorite summer lettuces called Costal Star. It sure can handle the heat! Mini Sweet Pepper Snacking Mix-A colorful assortment of sweet beauties. 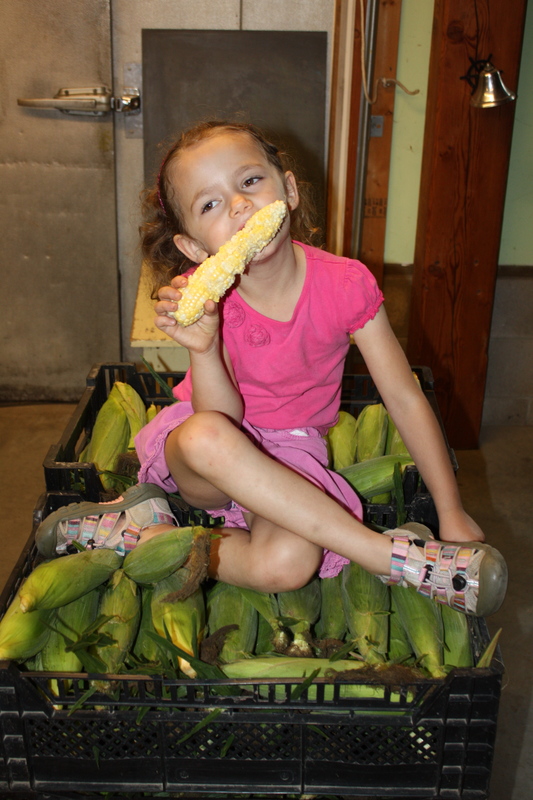 Sweet Corn-4 ears in each share. Melon-Our best cantaloupe season ever! Enjoy the second week of this sweet treat. Maeve mentioned that she is about “cantalouped” out as we eat it at every meal this time of year. French Filet Green Beans-Last of this harvest for a few weeks. 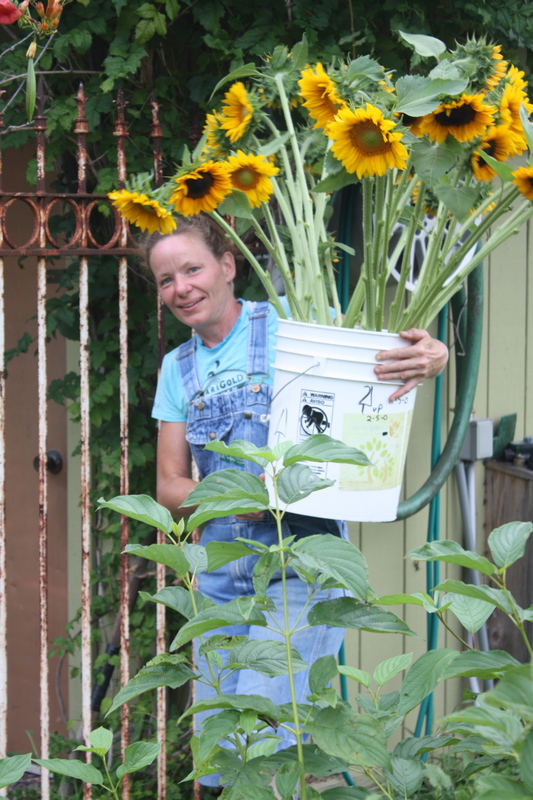 Sunflower Bouquet-A favorite summer treat. Cucumbers-An assortment and end of season good-bye to this summer crop. End of the cucumber harvest. Full Pint Cherry Tomato Mix. Sweet Corn-8 ears in each share. 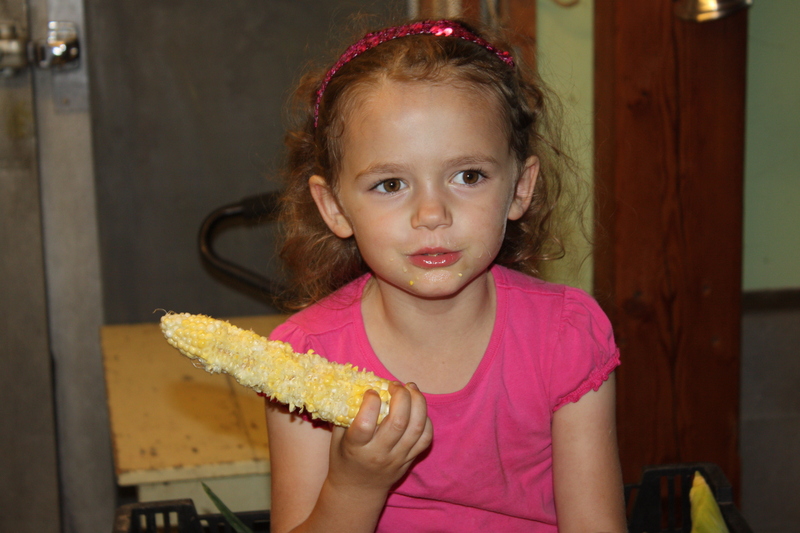 Maeve sampling the corn harvest. She thinks raw sweet corn is the best. Finishing up her second ear. Melon-Our best cantaloupe harvest ever! Enjoy the second week of this sweet treat. Maeve mentioned that she is about cantalouped out as we eat it at every meal this time of year. Spinach-I just have to say it again….we are thrilled that we are able to offer this tasty delight in the heat of summer. ENJOY! Ground Cherries-A snack we look forward to every summer. Keep on the kitchen counter and they will just get sweeter and sweeter. Jimmy Nardello Sweet Peppers-Long skinny red guys that taste like candy. 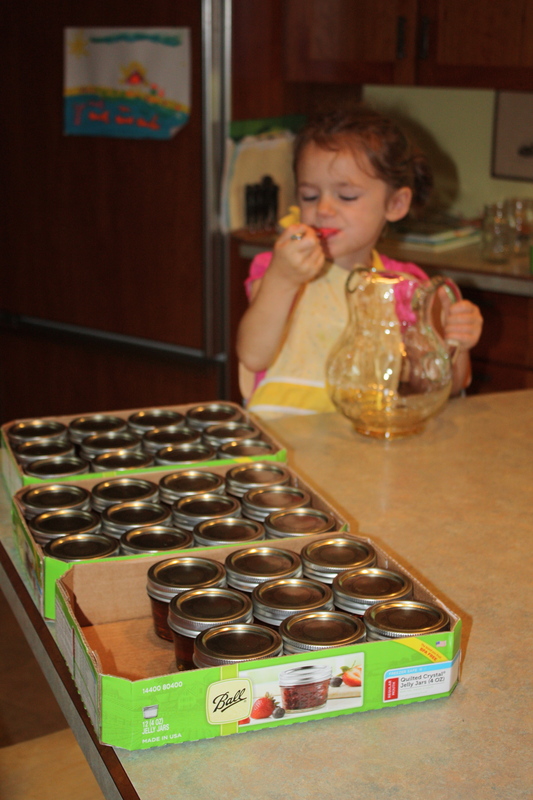 Backyard Honey-Another sweet treat from the garden. Finishing up the honey pour and Maeve gets to lick the pitcher. 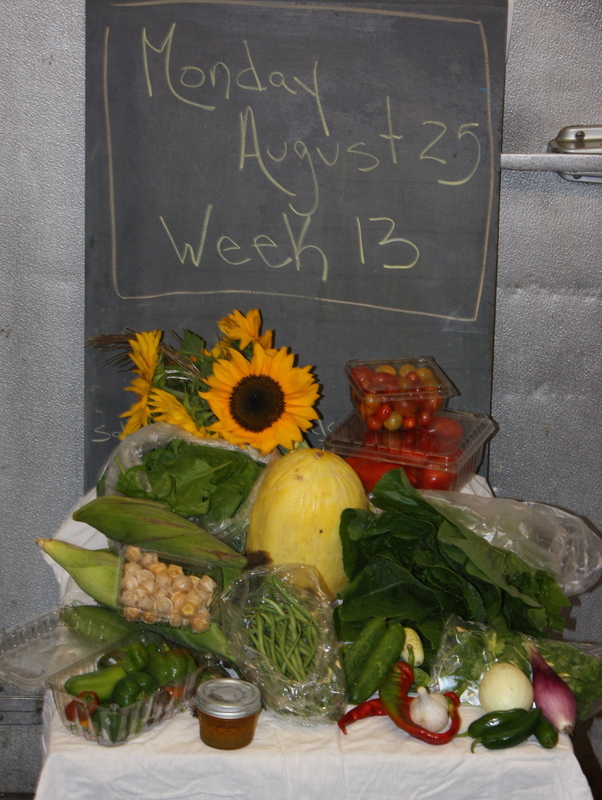 BEST GUESS FOR NEXT WEEK-edamame, spaghetti squash, potatoes, lettuce, corn, tomatoes, maybe a few more melons and more….. I don’t know if I ever recommended to you the cookbook “1000 Vegetarian Recipes” by Carol Gelles. It is an amazing cookbook and one I have used for years and given as gifts. Every single recipe I have used is delicious and basic, nutritionally amazing. I am always shocked when I have ingredients from our CSA box how many I can use together. This is the best cookbook I have ever owned for creativity and nutrition. Happy New Year-Welcome 2019! CSA registration open to all past members.